Are you running out of space for your comic books? Forgot to renew your subscription? Worry not – you can buy and read comic books anywhere with ComiXology’s Comics app for Windows 8. ComiXology’s Comics app is also available on iOS, Android and Kindle Fire. Sequential art – probably best recognised in the form used in comic books and graphic novels – has become increasingly popular in the past 15 years, following a major slump in the 1980s/early 1990s. So it makes sense that you should be able to read comics on your computer or tablet. I first played around with comic reading apps back in 2005/6, with a Windows Mobile app designed to read CBR/CBZ files (essentially RAR or zip archives full of scanned comics, numbered sequentially). In the intervening years, I’ve written a trio of comic books and read considerably more, some from masters like Alan Moore, Neil Gaiman or Transformers’ oft-underrated Simon Furman to newcomers like Emily Carroll. To be honest, there is nothing like the experience of unwrapping a brand new comic, opening the cover and breathing in the smell of the ink (despite how it has changed over the years). 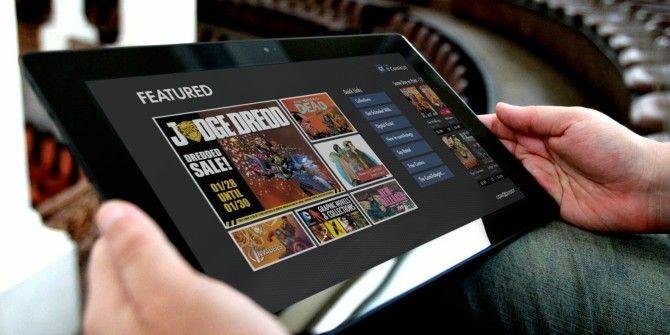 However, if printed comics aren’t practical (you might be travelling, or downsizing) then digital comics are the way forward, and Comics — an app by ComiXology, available free for Windows 8 Modern devices – offers a great reading experience with a vast library of new and old comics to enjoy. After installation, the app will ask you for permission to run in the background. If this is something you’re happy to do then the app will alert you when new comics are released. Although a free app, Comics isn’t necessarily free to use. Content – in the shape of comics – must in most cases be paid for. As one might expect. However, don’t take this as a hard and fast rule. 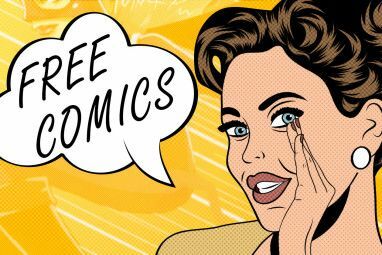 Many publishers take advantage of Comics as a promotional platform, offering free copies of prologue “Issue Zeros”, and these are a great way of getting your comic book fix with this app. Buying a comic is easy, however. Start by performing a search (using the Windows 8 charms bar) or browsing the items that are being promoted on the main page of the app. When you find an issue you want, open the description page and tap the price button to add it to your cart. You can then open the Shopping Cart and tap Checkout to purchase. If you don’t have a payment method setup already, you can add this here. A few minutes later, the comic will have downloaded to your Windows 8 computer, ready to read. Reading comics is exceptionally easy, thanks to an intuitive gesture/click system. To read a comic in your library, swipe down from the top and select My Comics. From here, tap to Download the title you want, or Read to open an already-downloaded comic (there is a small bug that seems to display Download as a default, even on comics you’ve previously downloaded – just tap Download and then the Read button will appear). 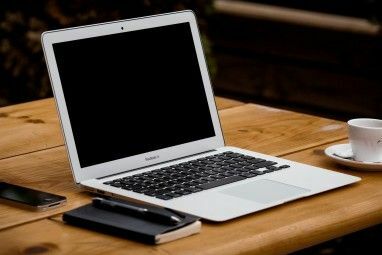 Switching between pages (the generally-accepted method of reading a comic) is done by tapping the edge of the screen on tablets, or clicking your mouse. You can open the app setting (via the Charms menu) to adjust transitions, letterboxing and whether pages are displayed in Guided View. The Guided View system – wherein each successive frame of the story is shown in turn with zoom and pan effects – is enabled by double-clicking a frame. You can disable it using the same mechanism. One thing you may notice reading your comics on a Windows 8 tablet is that they cannot be enjoyed in portrait mode. This may not be an issue (it’s much easier to read in portrait mode on an iPad Reading eBooks on Your Tablet: Windows 8 vs. iPad Reading eBooks on Your Tablet: Windows 8 vs. iPad I'm off on holiday today, and intend to do a bit of reading. This is all very well, especially when it comes to my handful of print books that I want to catch up with.... Read More ), especially with guided mode, but on the other hand it is disappointing not to have this option. As mentioned in the introduction, ComiXology’s Comics app is also available on iOS, Android and Kindle Fire. Across these platforms, the user experience is largely uniform, with similar user interfaces and a purchase/download process that is pretty robust. Only the differences in these platform’s user interfaces separate the app. This has its benefits, not least in syncing your reading across multiple devices. While Comics doesn’t have as strong a bookmarking facility as, say Amazon’s Kindle app (which we consider the best eReader for Windows 8 What's the Best E-Reader App for Windows 10? What's the Best E-Reader App for Windows 10? Does reading ebooks on your computer sound mad? Newer, lighter Windows 10 devices make this a much better experience. Let's take a look at the top eReading apps from the Windows Store. Read More ), it is good enough to use. You could start the day reading a comic on your Kindle Fire, pick it up in the lunch queue on your smartphone and then enjoy it again later on your Windows 8 tablet. Comics is quite usable on non-touchscreen Windows 8 devices, but the better experience is found on tablets. All in all, with its unparalleled library of titles, this is the best way to buy and read comics on Windows 8. Although you may miss the ability to read in portrait mode, most Windows 8 tablets are a little heavy on the wrist and guided viewing is an excellent feature. A recommended app for Window 8 tablets, Comics can be found in our list of the Best Windows 8 Modern Apps. Explore more about: Comics, eReader, Windows 8. I vastly prefer CDisplay/CDisplay EX for comic viewing, as I can't stand "library apps" that move my files around; I organize them the way *I* want, so I don't need copies placed where the app wants them, just a way to open a CBR/CBZ archive from Explorer. ACV is a great Android app that works the same way. I guess everyone's mileage may vary but comixology support acknowledged that there was a problem with their app and a look on their reviews section show I'm far from alone. I'm just commenting because when it works its my favorite app and just wish it worked smoothly without always having to reinstall and redownload the comics. Hi Bob - haven't had any problems with this app (except for a problem with a purchase that was not platform specific) so I can't comment on that BUT there does seem to be a problem with Windows 8 apps whereby the only solution is to uninstall and reinstall. It seems to me that this is an issue with the operating system, so hopefully Microsoft will do something about it. Comicrack is the best comic reader and manager for windows.It is free and comes with android app and capability of synchronizing between pc and android device.It is the best comic reader ever but it doesn't have a store to purchase comics but can read stored comics and over the network.supports a variety of formats eg .7z,rar,zip,cbz,cbr etc.Give it a try. Thanks for the recommendation, Rajdeepak S - I'm certainly going to give it a try!